The success of YES! requires partners and many individuals to become involved in the program and many have come forward to make these sessions effective. Participants learn more about the area and the importance of their efforts to restore native species and habitats from the FROG Team at the start of the 2015 season. The four partner organizations supporting YES! have been linked since the 2012 pilot program and recommit each year to the next season of YES! Partners meet year-round to evaluate, refine, pool resources, and work out any issues that develop; consequently the YES! program activities are almost year-round for the partners. The roles of partners and individuals have become fine-tuned and represent the strengths of the organizations or individuals. 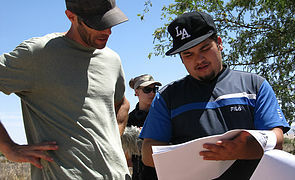 University of Arizona scientist Jason Field consults a satellite map with YES! steward Roberto Rojo. A key ingredient in YES! success is the participation of scientist, managers and other professionals. The YES! Mentors are scientists and professionals constantly engaged with the students offering expertise in cultural resources, ecology, wildlife biology, land management, etc. 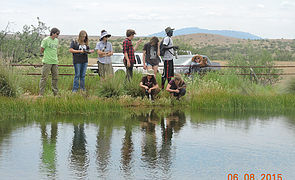 Mentors are critical because they: 1) are working in the field at area locations so that students have a chance to engage in “real” science or management actions; 2) offer additional field opportunities in their own programs for youth; 3) provide a professional contact point; 4) offer specific expertise as part of the assessment or the project phase. Our partners have included Caldwell Designs, Pima Association of Governments, Arizona Game and Fish, National Park Service, US Fish and Wildlife, The Nature Conservancy, the University of Arizona, and others. The YES! Classes of 2013, 2014 and 2015 organized Volunteer Days for the last field session inviting their families and friends to join in on the hard work. Both days were successful. While this feature depends on the youth decisions on how to carryout their projects, we think this might be adopted by future YES! groups too. Ready to learn more? View a recent or upcoming YES! schedule.